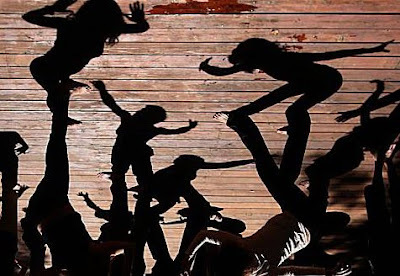 Dancing Shadows - 10:25 a.m. - Liked the shadow placement of students doing a participatory life/art workshop. The image is upside down. Camera settings: Canon EOS 5D Mark II, ISO 100, 1/400, f8, 30mm. From a gallery of outtakes by San Francisco Chronicle photographers.